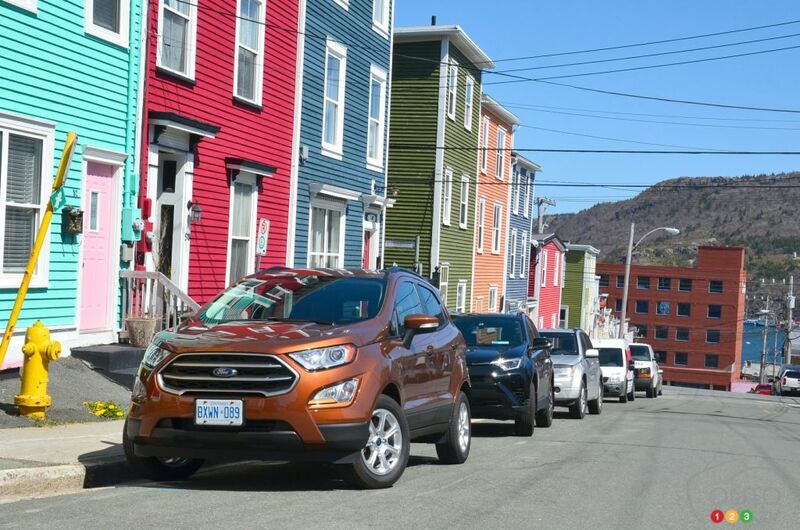 St-John’s, Newfoundland – Ford Motor Company has sure made a lot of headlines since announcing that it was dropping virtually all of its cars from its North American lineup. No doubt, the automaker is intent on moving the ship in a new direction, by offering a lineup heavily weighted to utility vehicles. While Ford already offers a number of such models, that number is sure to grow in the next three years. Already, the Dearborn-based manufacturer is getting reinforcements in the subcompact-crossover segment with the arrival of the 2018 EcoSport, a “mini-truck” already in service since the latter part of last winter. Ford Canada invited a few members of the automotive press to the eastern tip of the country to discover up close its newest utility vehicle. The EcoSport is not technically “new”, mind you, as its second-generation edition is already sold elsewhere in the world, and has been since 2012, when ti made its official debut at the Auto Expo show in Delhi, India. To say that this model was developed with emerging markets in mind is an understatement. Now, we’ll get to see how it performs in a developed market like ours. 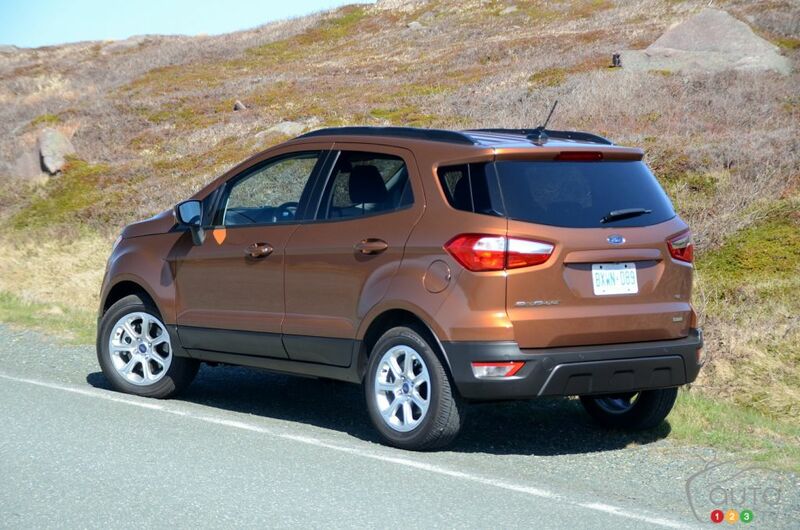 The current popularity of the small-SUV segments will undoubtedly play in its, and Ford’s, favour. Given the mass-market, affordable aspect of its category, the 2018 Ford EcoSport is offered in four distinct flavours: S, SE, SES and Titanium. 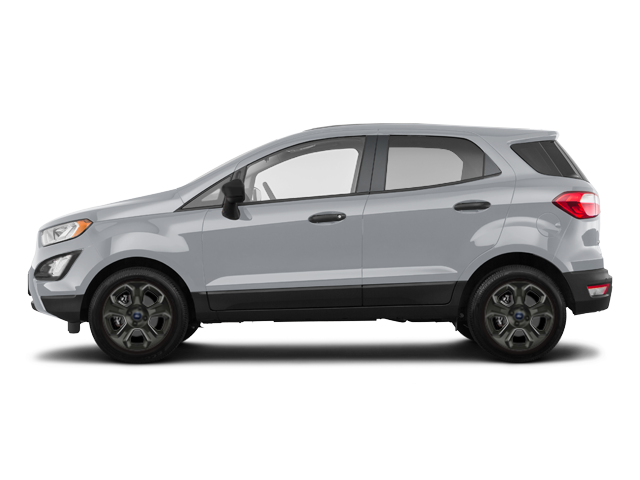 At $22,099, the S version is the entry model, and Ford itself says it will likely account for only a small percentage of the model’s sales. Next up is the SE, which comes with a $25,099 starting price, but also with much more standard equipment, for example a power sunroof, smart key, heated seats, automatic climate control, the SYNC 3 system and on and on. For the “sporty” crowd, the SES version, beginning at $29,399, adopts a unique exterior design (17-inch anthracite wheels, different front grille, headlights and parking lights, etc.) in addition to getting a more spruced-up interior. The suspension is also firmed up, while the 2.0L 4-cylinder engine and all-wheel drives are standard equipment. Finally, at the top of the heap sits the Titanium edition, which begins at $28,599. This one also comes with 17-inch alloy wheels, as well as heated seats and steering, leather seats, a battery of drive-assist systems and even a 10-speaker premium Bang & Olufsen audio system that blows 675 watts of sound at you. 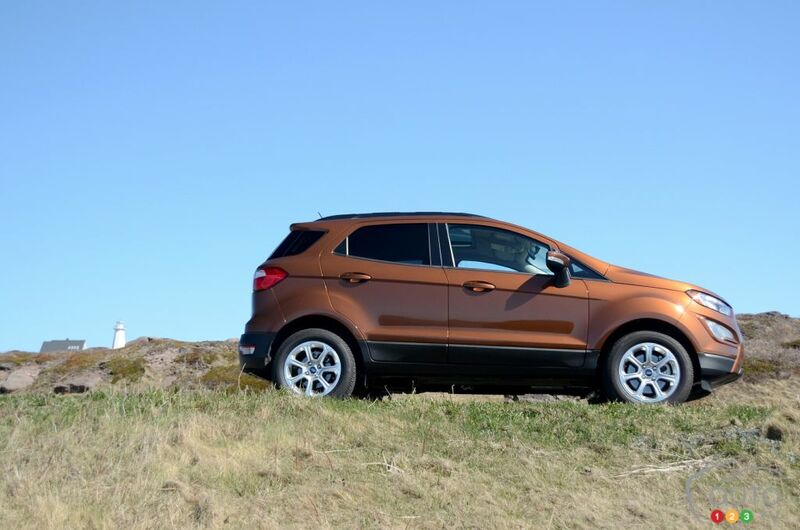 With the exception of the EcoSport SES, all versions come with front-wheel drive and the 1.0L 3-cylinder turbo engine. Getting the available all-wheel drive will set you back an additional $2,500. Ford also decided to simplify its options packages to make life easier for consumers interested in the model. The SE Convenience package isn’t cheap at $1,750, but tech lovers will appreciate the larger 8-inch touchscreen whose commands can be enlarged. The BLIS system for monitoring blind spots is another interesting add-in; ditto for the satellite radio. The other must-have options package for Canadian motorists is without a doubt the Cold Weather package, which brings with heated carpet, side-view mirrors, steering wheel and windshield wipers, and only costs $350. The Ford EcoSport sits on the same platform at the current Fiesta. No surprise then that its footprint on the road is pretty similar to the subcompact car. In fact, Ford’s announcement RE its cars means that the fiesta’s spot in the lineup is actually being taken by the EcoSport. But take note that the new model is taller than the Fiesta, both in terms of its total height and its ground clearance. 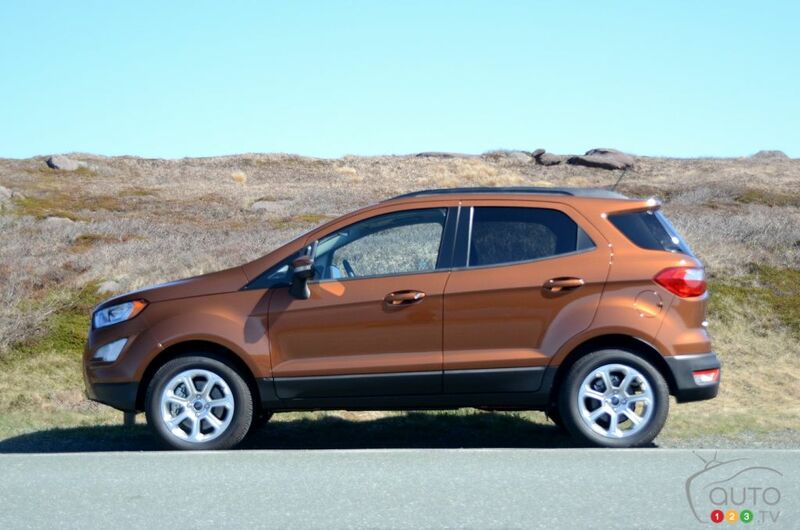 The exterior design doesn’t stray very from the Ford family tree. The front end gets a prominent front grille, while the angular light clusters huddle on each side of it. In back, the parking lights looks quite a bit like the Escape’s, but unlike it, and unlike others in its segment, the EcoSport features a swing-open door (opening from right to left, via a handle integrated right into the right-side light. Inside, the dashboard is a mix and match of old and nw. The touchscreen mounted in its centre constitutes the vehicle’s newest element, while the design of the dashboard is clearly inspired by older Ford models. Like in other crossovers, the driver’s position is higher than in a car, and that applies to the back row of seats as well. Although legroom is a little limited, I must admit the height of the bench makes for a comfortable seating position. Ford’s engineers did not neglect the all-important issue of connectivity, and have integrated a sleeve on the back of the front passenger seat, perfect for placing a tablet in good viewing position, and even an additional pocket on the side, for smartphones. With the inclusion of 4G LTE wireless, the EcoSport is as connected as the best of them! Under the hood, Ford called on two engines already familiar to consumers. The 1.0L 3-cylinder EcoBoost engine produces 123 hp and 125 lb-ft of torque, appropriate or at least sufficient for an urban vehicle. Wedded to a 6-speed automatic transmission, this powertrain does yeoman work and is really discreet when at cruising speed. As well, its fuel consumption is exemplary, as long as the driver doesn’t try to push things too much. The only downside is that you can’t add all-wheel drive to it. To get that, you have to opt for the 2.0L naturally aspirated 4-cylinder, which is actually taken from the current Focus. This one is noticeable more dynamic with 167 hp and 149 lb-ft of torque. The “big” enfine also teams with a 6-speed automatic, but my first drive showed me that this gearbox seems to search continually to find the right gear that will minimize fuel consumption, which translates into lags when downshifting. The steep hills of Newfoundland exposed the weakness of this powertrain on a few occasions. The EcoSport is a pretty nimble crossover, as a proper city vehicle should be; however the suspension and short wheelbase do make it a bit jumpy on bumpy road surfaces. Also, sound insulation in the small SUV is nothing to write home about, not to mention that its high stance makes it a great target for crosswinds. Again, Newfoundland being such fertile land for strong winds, we were able to witness this first-hand. Ford is a bit late ot the party in the tiny-SUV segment, at least in Canada, and I have to say the price being asked for the higher trims is a bit on the hefty side. My favourite of the available bunch was definitely the SE version, which Ford believes will attract the most Canadian buyers. The absence of all-wheel drive to go with the EcoBoost engine is not ideal, but hey, the Ford EcoSport is not the only small crossover to get by on front-wheel drive. While it’s true that all-wheel drive is a plus in our climate, a front-wheel drive vehicle gets the job done most of the time. 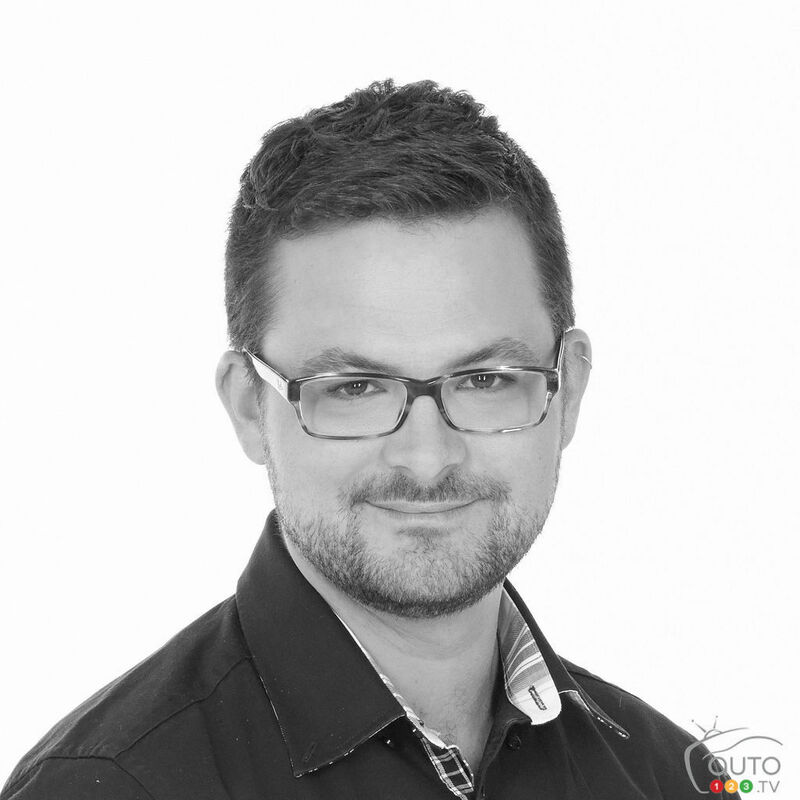 In my view, the turbo is the more interesting option, namely because it’s quieter, more fuel-efficiant and better adapted to the transmission that comes with the model.